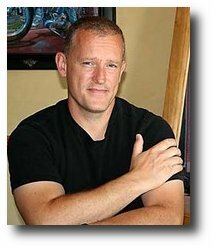 Bryan began his art career when he was a child when his father mentioned to him that thought he was bound to become a commercial artist while watching Bryan draw one day. That seemed to stick. So it was off with the thoughts of becoming an astronaut and on to becoming an artist. It was, however, many years later that that dream would become reality. Only while in his thirties and after having a wife and several children and a home to look after that Bryan decided it was time to start making that become a vision become a reality. So while armed with a beautiful family he began forging a career that has arrived today as a full time vocation. 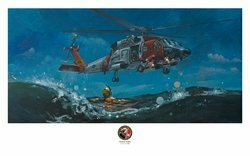 Bryan has been working with the U.S. Coast Guard, Air Force and Navy for many years now and his work has illustrated the history of their respective aviation programs. Bryan's work is proudly displayed in many personal collections around the world. He has had the privilege of having work displayed in many military and museum collections. Included in these are the National Museum of Naval Aviation. 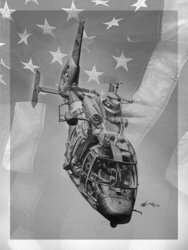 the Pentagon, 160th Special Operations AviationRegiment (Airborne), Coast Guard Headquarters, Navla Air Station Whidbey Island, Coast Guard Air Stations Detroit, Traverse City, Barber's Point, Sitka, Kodiak, ATC Mobile, Elizabeth City, Savannah, Clearwater and more! Bryan has the distinct honor of being the recipient of the 2016 R.G. Smith Award. 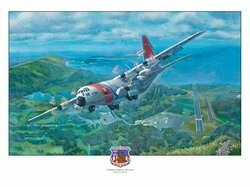 One that is given once a year to an artist that has acheived excellence in Naval Aviation Art.